We are so honored to work with clients around the world, and we’re constantly learning about their fun and unique projects, obstacles they’ve faced and the innovative solutions they’ve created to overcome challenges. That’s why we’ve created this new feature that spotlights professionals. 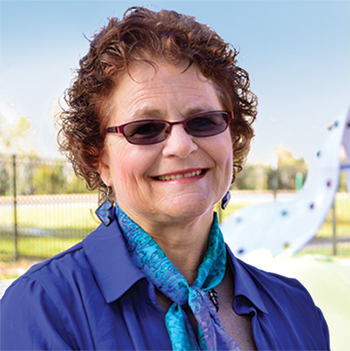 This week, meet Dr. Lucy Jane Miller, founder of the Sensory Processing Disorder (SPD) Foundation and the STAR Center. Below, you’ll learn how she came to begin her career, and what lead her to start the SPD Foundation. When I was 16-years-old, I stopped seeing things the way other people do. Literally. I was in college before we solved the mystery of my fading vision. By then, wearing contact lenses for more than a few minutes had become agony and even enormous shapes were fuzzy without them. It was my alarmed freshman roommate who insisted I see a doctor at the school clinic, triggering a series of referrals that finally brought answers and help. I was diagnosed with advanced kerateconus, a disease that distorts the corneas and—without treatment—eventually, leads to blindness. The diagnosis was grave but it also came as a relief. My vision problems weren’t all in my head after all! The symptoms were real and they had a name. I finally knew what I was fighting and could make a plan for fighting it. The year was 1971 and the cure for the disease was corneal transplants in both eyes, a procedure only two doctors in the U.S. were qualified to perform. I went on a waiting list for donor corneas, doubling up on classes so I could finish college before my surgery, learning Braille and practicing with a white cane, just in case the cure didn’t work and I lost what was left of my eyesight. A few weeks before graduation, I reached the top of the list for my first transplant. During the two-hour surgery, the old bad right cornea was removed and a new donated cornea was stitched to my eyeball with 16 sutures that would jab my eye and eyelid like teensy relentless needles for the three months after surgery when both my eyes had to be patched. The operation was a total success, but I felt lost in my carefully maintained darkness. The endless stream of doctors, fellows, residents and medical students who gazed admiringly at my eye murmured, “beautiful, beautiful,” but I didn’t feel beautiful at all. I couldn’t see. I made a mess when I tried to eat. I couldn’t perform basic personal hygiene tasks and, after a lifetime seeing people when I talked, it didn’t feel like communication when I talked in the dark. What’s more, the admiring medical people who visited seemed to care only about my beautiful new eye. I felt reduced to a single sensory organ—an eyeball. Then a new person entered my life. She was a young occupational therapy student doing her internship and she had been assigned to teach me how to feed, dress and take care of myself. She was about my age and showed no interest in my eyeball at all. Instead, she talked to me, Lucy Jane Miller, and listened to what I said. She always wanted to know how I—not my eye—was doing and she told me little things about her life so we had a real relationship even though I couldn’t see her. I silently called her “Angel” and imagined her with long blonde hair, blue eyes, a perfect Olympian body, and a halo, of course. I learned to identify her footsteps and detect her scent so I could say, “Hi, Angel!” just as she came into my room. Then came the day when Angel chanced into the room when my patches were being changed and I finally glimpsed my rescuer with my eyes as well as with my other senses. The sight astonished me. Angel was a polio survivor. Half her face and body had been paralyzed and left sagging by the disease. In my darkness, Angel was beautiful because I could only “see” the beauty that was inside. In the fog of recuperation, my future came into focus. While still in my eye patches, I applied to occupational therapy school. Two days after the last stitches were removed following my second transplant, I started graduate school. One of the first books I read with my new good eyes was the work of a pioneering occupational therapist and neuroscientist named A. Jean Ayres. In Sensory Integration and Learning Disabilities, Dr. Ayres wrote in detail about the behavioral, social and emotional issues that arise when a child’s sensory foundation is not firmly established early in life. She stressed the importance of early diagnosis of sensory disorders and described in detail how occupational therapy (OT) could and was helping children. Fresh as I was from my own darkness, Dr. Ayres’ words resonated instantly. Demoralized and disabled by the long-term repercussions of a doctor’s proclamation that my symptoms were all in my head, I knew how critical accurate and early diagnosis was. Barely out of my teens, I had known the humiliation of being unable to perform normal, everyday routines like other people my age. Grateful for Angel’s care, I was a firm believer in how dramatically OT could address sensory issues and improve a person’s life. Before first semester ended, I decided to spend my life promoting the understanding, accurate diagnosis and effective treatment of the sensory-based disorders that Dr. Ayres described. Learn more about Dr. Miller and the research, education and treatment she provides to help individuals struggling with SPD. Then read about our partnership with the SPD Foundation and the STAR Center, including its sensory playground. Dr. Miller created an inclusive playground with many sensory-rich activities at the STAR Center. This entry was posted in Inclusive Play, Inclusive playgrounds, Multisensory, Sensory, Sensory play, Sensory playground, SPD Foundation and tagged Dr. Lucy Jane Miller, sensory processing disorders, SPD Foundation, STAR Center by PlayLSI. Bookmark the permalink.